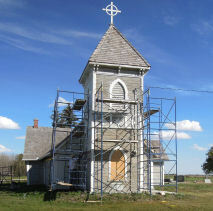 All Saints has been lovingly cared for, but time, the elements (and some creatures) have taken a toll. The last big structural intervention was made in the 1960s! Some of the problems to be addressed are shown here. 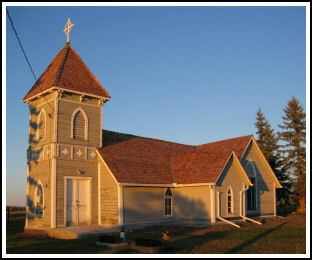 In the spring of 2011, the congregation engaged Jack Edinborough, a contractor from Mossbank who has specialized in heritage buildings. Jack arrived on site at the end of June. 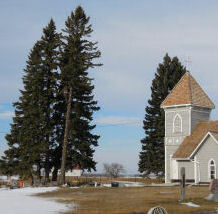 Leigh Robinson has studied, rescued and restored a number of heritage buildings in the Moose Mountain area. This summer, Leigh has put in untold hours expediting and overseeing the work. 1. The section of the valley beam that had disappeared was reconstucted. 2. The corner with mushrooms was rebuilt and rejoined. The telepost dates to the 1960's and was a surprise. 3. 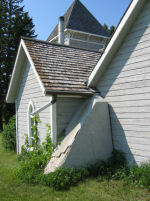 The roof was shingled completely and a steel beam was built in to strengthen the north-south transept peak. 4. Louvres in the belltower were repaired and made animal proof. 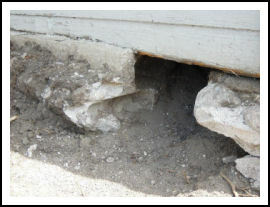 A substantial lime and rock foundation was discovered below the walls. Moisture had significantly rotted the bottom logs on the north side. Removal of the foundation and buttresses was hard labour; tying the walls back into the joists and strategically placing jacks for the lifting process was made difficult by the lack of space in which to manoeuver. 2. 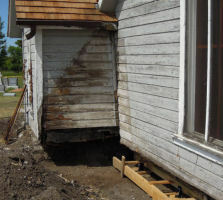 The foundation was dug out, rotted part of logs removed and replaced with treated wood. 3. The walls and joists had to be plated together, and a slow lift on walls has been done. 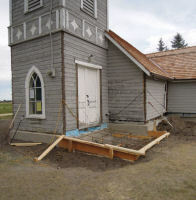 A new foundation was poured in sections with jacks left in place. 5. The rubble removed and forms for the ramp in place. We were fortunate to have completed the bulk of the structural work this summer. 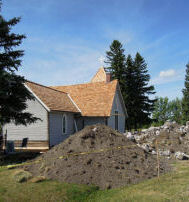 Eavestroughing was installed in September and on October 15, we had a "bee" to complete the grading around the foundation so that spring melt or rain would run away from the Church. On another day, Wes and Wayne put the fence back up on the north side. Contouring around the foundation of the church. Services resumed this season with the added comfort of an electric furnace. 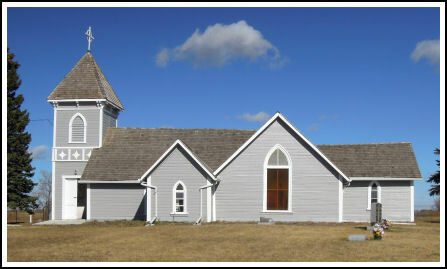 Exterior painting was done in late August and early September by Jack Edinborough. We thank all those who have contributed to revitalizing All Saints Cannington Manor. 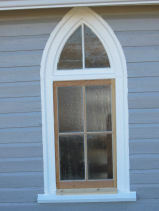 Two new window frames were installed, replacing originals which had deteriorated. 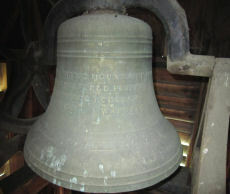 All Saints received Municipal Heritage status in 2009 which has enabled us to apply for matching grants. 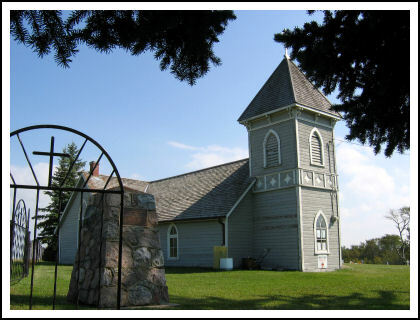 We are grateful to the Saskatchewan Heritage Foundaton for their support as well as the Community Initiatives Fund. 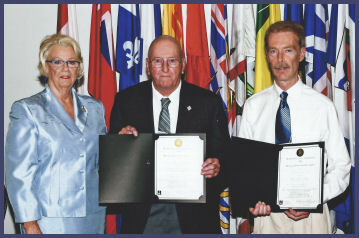 On June 12, 2012, the Hononourable Mrs. Vaughn Solomon Schofield presented five Lieutenant Governor of Saskatchewan Heritage Architecture Excellence awards at Government House in Regina. 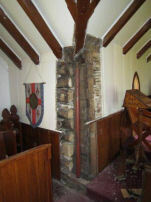 All Saints Church of England at Cannington Manor was recognized for the 2011 restoration in the category of Exterior and Interior Conservation. Wes Palendat (Senior Churchwarden) and Leigh Robinson (Project Manager) accept the awards from Her Honour.